"Seme" is a beautiful, 1/2 Accoyo, Full Peruvian, white herdsire that has thrown color and amazing locks on his crias. 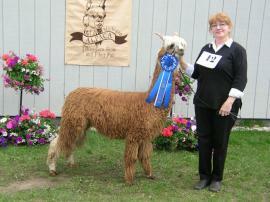 Seme is the first cria born by Full Accoyo USA Camion. 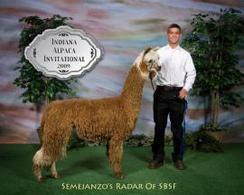 His dam, 5Peruvian USA Pintada 8221, is a medium brown pinto with white markings. Pintada has produced fawn, brown and rose grey cria as well. 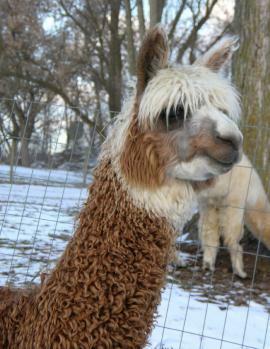 Pintada seems to have the ability to pass on the two-tone fiber to her cria since 4 out of 5 have been two colors. Seme is following in his dam's footsteps with this trait. 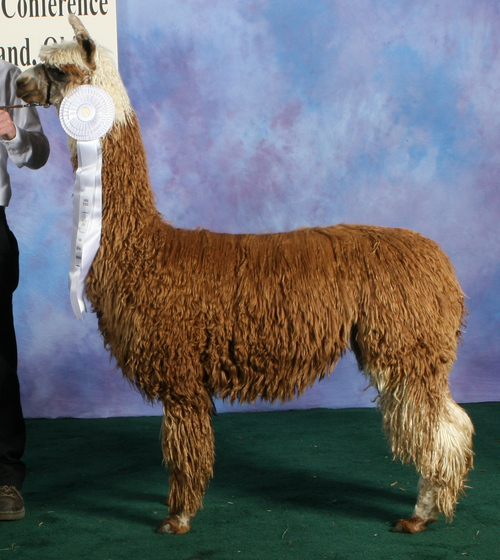 1/8 Bolivian, 5/8 Peruvian, 1/8 Other/Unknown - Valentine hails from Park View Alpacas breeding program, has a personality as sweet as her name suggests, and she passes that pleasing, calm disposition to her offspring. Valentine's pedigree includes Peruvian Fuego and Peruvian Aureo. We purchased Valentine as a package from SBFS in 2008 with her son Semenjanzo's Radar Of SBFS at her side, and another cria on the way. She has produced show quality light brown patterns. She gave us our first and only pure white alpaca in May 2008, a lovely sweet and substantial girl we call Wanda. Valentine was bred to Rocky's Radar of Ravada Hills, and in May 2009 she delivered a strong male with the lustrous, greasy fine pencil locks so prized in Suris. He was named Chief because of his very proud, independent attitude, and will begin his show career in 2010. Valentine is a farm favorite, she is a calming influence in the herd and a solid producer. Radar is 1/4 Accoyo, multi-colored with rich luster, density and lock structure and his dam's gentle disposition. We purchased Radar as a juvenile from Stone Brook Suri Farms (SBSF). He was slick shorn in May 2008 and his regrowth for 2009 was seven inches of lovely twisting locks. 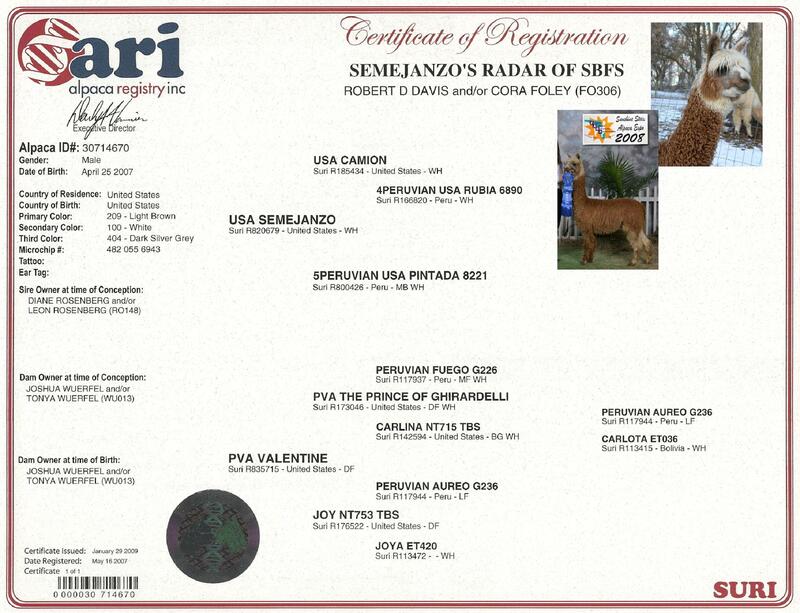 Radar continues the multi coloring tradition of his sire and granddam. 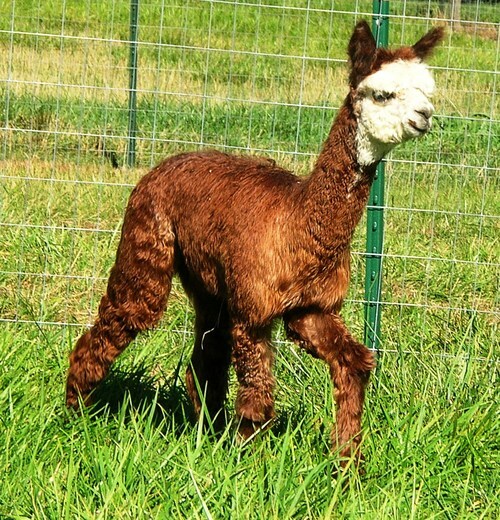 Radar has a gray face, offering different color or pattern possibilities, proven by his first cria. Radar bred to our classic dark silver gray Tealwater Rosalie produced a real show stopper - a large rose gray male with beautiful luster and fineness. Tragically, we lost that little show potential to an allergic reaction at 6 weeks old - he found a hornets nest in the pasture. 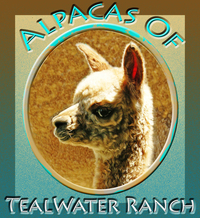 We repeated the breeding, accepting the risk of breeding two white-spot gene alpacas and got another high-luster pattern beauty, Elizabeth. Radar is a heavy boned, calm male, expected to pass color genetics, luster and lock structure to his offspring. Contact us for fiber samples or to talk about the pedigrees of your dams and your breeding program goals.